The team plays in claret and blue shirts with blue shorts (originating from the kit of FC Barcelona) and holds home games at the Ipurua Municipal Stadium. SD Eibar is a fan-owned club, with more than 10,000 shareholders from 69 countries all over the world. Until SD Huesca qualified for the top flight in 2018, the club was considered the smallest to have played in Spain's top division, and its stadium had the lowest capacity of any La Liga teams. Although Eibar is the sole professional club of its town, it contests several Basque derbies with other clubs from the region. 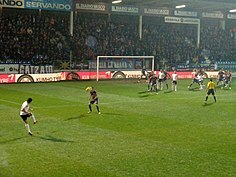 In 2013–14 Eibar earned, for the first time in its history, one of two direct promotion berths to La Liga, which was certified on 25 May 2014 with a 1–0 home win against Deportivo Alavés. (they celebrated their feat with confetti originally produced by Barcelona, who wear the same colours and had anticipated winning the Spanish league title a week earlier, but that did not come to pass). Simultaneously, however, the club was threatened with relegation back to division three due to the financial inability of the S.A.D. to have a share capital of at least €2,146,525.95 before 6 August 2014. The club launched a campaign named Defiende al Eibar (Defend Eibar) with the aim of reaching the required share capital through a seasoned equity offering. On 15 July 2014 the club announced it had reached the established goal. The club's 10th place in 2016–17 was improved to 9th the following season, with the latter campaign marking the first time ever that Eibar had finished as the highest-ranking of the Basque teams. In summer 2016, the club expanded its club structure further by integrating local team Urkomendi (of the 6th level Preferente de Guipúzcoa) into the organisation as a reserve team to act as a link between the youth level and Vitoria, to be known as Eibar Urko. Urkomendi (formally Urko14 Alkideba Fútbol Taldea) had been founded only two years earlier by a group including several former Eibar youth players who had been released precisely because there was no structure between the junior and senior teams to accommodate them. The hope of the management was that both new subsidiary teams would move up to a higher level to improve the standard of competition for their players' development. 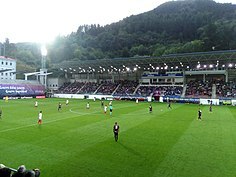 Playing in the town's Unbe Sports Complex, Eibar Urko gained promotion to the fifth level in 2018. Also in 2016, Eibar made a 3-year collaboration agreement with UD Logroñés, with Eibar players going on loan to the Segunda B club for experience with the aim of achieving promotion due the additional talent in the squad. Four players made the move that summer: goalkeeper Jon Ander, defender Amelibia, midfielder Sergio García and winger Thaylor. José Luis Mendilibar is the current head coach of Eibar. ^ a b c d e Matt Davis (29 November 2018). "Eibar: The female president & football philosophy behind Real Madrid conquerors". BBC Sport. Retrieved 30 November 2018. ^ a b Raphael Minder (23 July 2014). "A Tiny Club's Uneasy Rise". New York Times. Retrieved 9 January 2019. ^ "El CD Vitoria jugará en Olaranbe los partidos de Segunda B" [CD Vitoria will play its Segunda B matches at Olaranbe]. Gasteiz Hoy (in Spanish). 21 July 2017. Retrieved 8 March 2018. ^ "Competiciones: Regional Preferente Grupo 2 2015/2016". Kirolak (in Spanish). 15 May 2016. Retrieved 17 October 2018. ^ a b "El SD Eibar refuerza el fútbol base con la compra del Urkomendi" [Eibar strengthens their academy by acquiring Urkomendi] (in Spanish). Palco23.com. 15 June 2016. Retrieved 29 January 2017. ^ "Nace el Urko14 Alkideba FT de fútbol" [The Urko14 Alkideba FT football is born]. Diario Vasco (in Spanish). 30 April 2014. Retrieved 17 October 2018. ^ a b "El Eibar se fusiona con el Urkomendi para que sea filial azulgrana" [Eibar merges with Urkomendi to be a maroon-and-blue branch]. Mundo Deportivo (in Spanish). 14 June 2016. Retrieved 17 October 2018. ^ "El Eibar consolida su estrategia con la base" [Eibar consolidates its strategy with the base]. Mundo Deportivo (in Spanish). 18 May 2018. Retrieved 16 October 2018. ^ "El Eibar presume de cantera" [Eibar boasts a quarry]. Marca (in Spanish). 15 June 2018. Retrieved 16 October 2018.